From his thirty-five years as a practicing psychiatrist and as an award-winning author of nonfiction and fiction, Irvin D. Yalom imparts his unique wisdom in The Gift of Therapy. This remarkable guidebook for successful therapy is, as Yalom remarks, "an idiosyncratic melange of ideas and techniques that I have found useful in my work. These ideas are so personal, opinionated, and occasionally original that the reader is unlikely to encounter them elsewhere. I selected the eighty-five categories in this volume randomly guided by my passion for the task rather than any particular order or system." At once startlingly profound and irresistibly practical, Yalom's insights will help enrich the therapeutic process for a new generation of patients and counselors. "If the future of psychotherapy lies in psycho pharmaceuticals and the short-term therapies stipulated by HMOs, argues Yalom, then the profession is in trouble. Yalom, the recipient of both major awards given by the American Psychiatric Association, professor emeritus of psychiatry at Stanford and the author of both fiction and nonfiction volumes about psychotherapy, writes this book in response to that crisis. Based on knowledge gained from his 35 years of practice, the resulting book of tips (a gift for the next generation of therapists) is an enlightening refutation of brief, superficial, and insubstantial forms of therapy. Yalom, who references Rilke and Nietzsche as well as Freuds protege Karen Horney and the founder of client-centered therapy, Carl Rogers, describes therapy as a genuine encounter with another person. He suggests that therapists avoid making DSM IV diagnoses (except for insurance purposes), since these threaten the human, the spontaneous, the creative and uncertain nature of the therapeutic venture. He also encourages psychotherapists to use dream analysis, group therapy and, when appropriate, wholly inventive forms of treatment. Traditionalists will probably squirm at some of his suggestions (particularly Revealing the Therapists Personal Life and Dont Be Afraid of Touching Your Patient). Other tips, though, such as Never Be Sexual With Patients are no-brainers." "Psychiatrist Yalom offers what he calls a series of tips for therapists, emphasizing process rather than content. Fortunately, his 85 brief advices, while certainly helpful to therapists and patients, may also help any thoughtful person seeking to improve relationships with others and self-understanding. 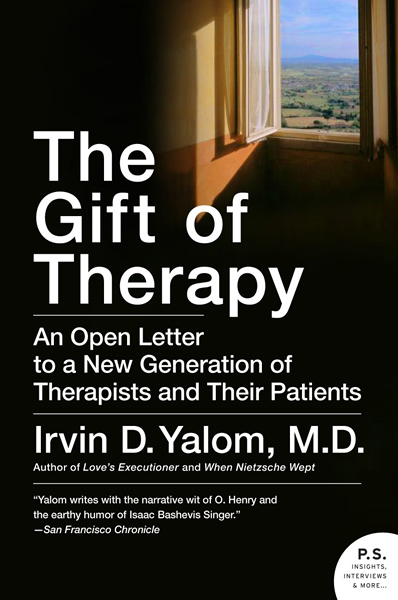 The effective therapist, Yalom asserts, combines various approaches to produce the best possible care for each patient, for therapy should be relationship-driven, not theory-driven. One of the major abominations in current psychotherapy, he says, is the formulaic approach favored by managed-care organizations seeking to cut costs and billable hours with patients. The tips, several of them oriented by the individual and group therapies with which Yalom has lengthy experience, deal with openness between therapist and patient; the many uses of note taking; emphasizing the here-and-now rather than the there-and-then; how to handle sexual feelings, repetitious and irrelevant comments, and boredom; and what to do with dreams. A seemingly narrowly focused book that may speak to a fairly broad audience."